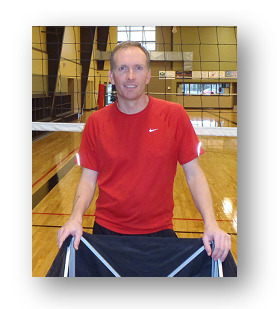 Hey – My name is Dennis, and I wanted to welcome you to my volleyball world. 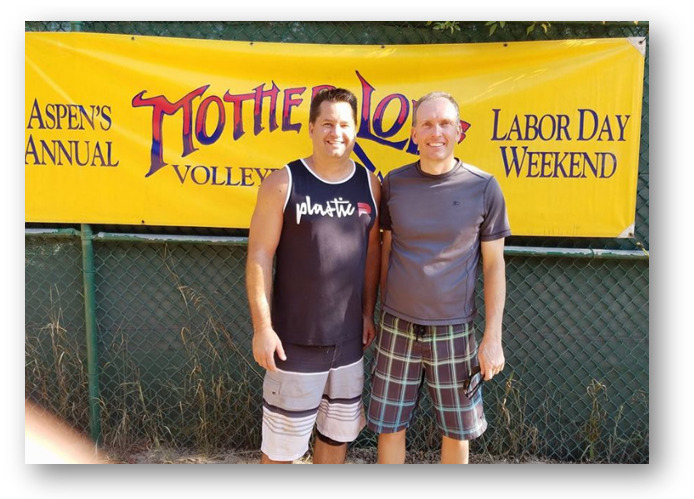 A little over 27 years ago, I started playing club volleyball. This popular sport quickly became my obsession. 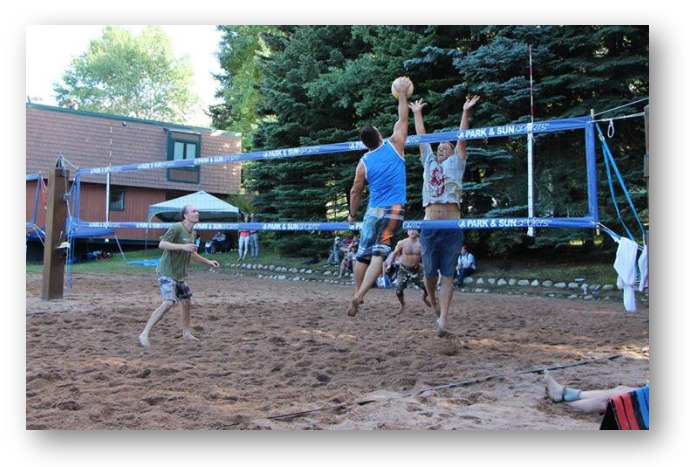 Since then, I have competed at a high level in both indoor hard court 6 vs 6 and outdoor 2 vs 2 (sand and grass). 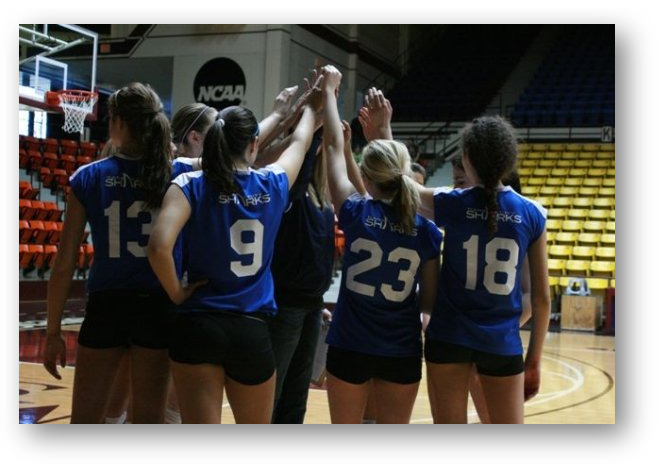 I have coached competitive girls volleyball club teams ages 11 to 18. I train competitive athletes for USAV indoor hard court and also outdoor grass and beach doubles competitions. 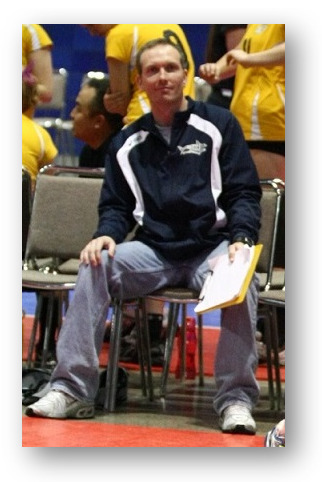 Strength-and-power-for-volleyball.com is where I share what I have learned about coaching and training for volleyball. My goal is to ALWAYS give away better stuff on this site for FREE, than other trainers charge for their books, videos, and live events. So, I told you before I’m a volleyball junkie. 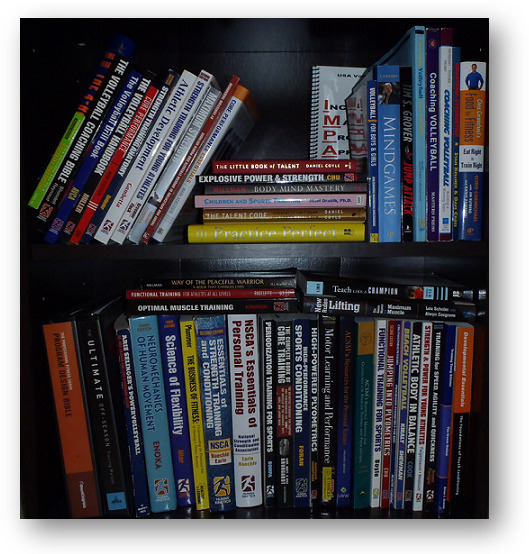 Yes… I collect volleyball coaching books and DVDs. Yes… at 41, you will still find me playing volleyball, training and competing at a high level. And I love training athletes... but before I was a coach and trainer, I was also a doubles champion. 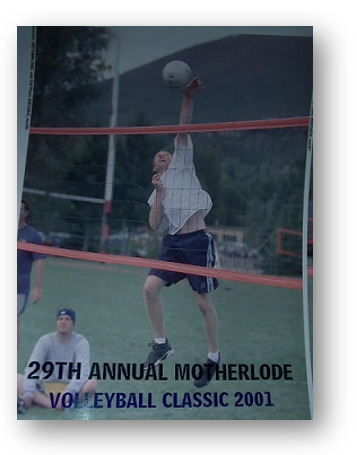 I guess I would say the highlight of my grass doubles career was playing in the AA Finals of the 2003 Motherlode Volleyball Classic. Playing with my doubles partner Skye Gosewisch, it actually ended up being a Double Final. Back then, we played sideout scoring (your team only scores when you serve) to 15 points. The team that wins the losers bracket, faces the team from the winners bracket in the Finals. Well, we won the losers bracket which meant we had to beat the winner of the winners bracket TWICE! In a crazy match, we won the first game 15-13, but then ended up losing the second game 7-6. From the image below, you can see we finished 2nd. I also finished 2nd in the same division the year before, but this time around it was a little different. 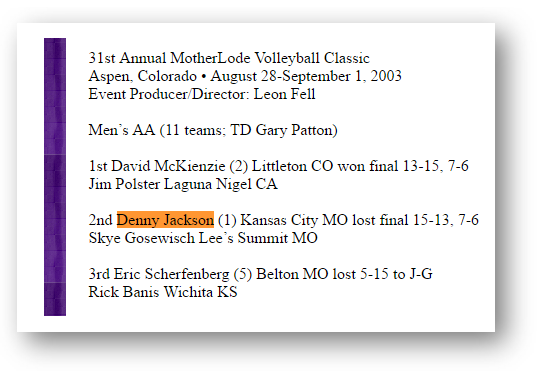 In 2003, we were competing against two guys that were currently on the USA Indoor National Team! A little over 10 years ago, a buddy of mine talked me into coming to his club teams practice. Little did I know, I was about to get a crash course in coaching. You see, my buddy Eric was a club director and a coach. He was real passionate about volleyball just like I was. Eric was a also a player, but he already had 15 years of coaching experience. Eric became my mentor and the next thing I new I was involved in team practices, tournaments, and coaching private lessons. My first season, I ended up working with 11 different teams, ages 11 to 18 and I was coaching 6 days a week! I guess my interest in sports specific training began back when I was playing Junior Olympic Volleyball. For about a month leading up to nationals, our team would condition every day in practice. From this experience, I started to think... maybe I could get a lot better at volleyball by focusing on a workout that was specific to volleyball. Back then, sports strength and conditioning wasn’t like it is today. You couldn’t search on the internet for sports specific training books and dvds. And there certainly wasn’t any website focused specifically on strength and conditioning for volleyball. Just from looking at my teammates, almost every single one of them didn’t workout. They were all considered “naturally” athletic. I became more curious about athletic training and what I could do to improve my game. I soon discovered the field of sports performance training. This is different than conventional training methods such as muscle building or weight loss. A program that includes sport performance training has to be developed specifically for that sport. 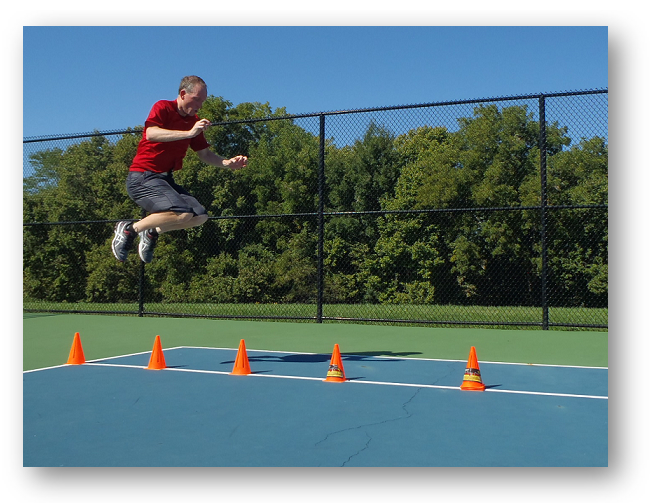 This type of training is all about explosive movements, reaction, speed, and agility. This kind of training sounded exactly like something that could really help me. Next, I discovered there were certification programs for this type of coach. So naturally I started looking for the best program. The National Strength and Conditioning Association (NSCA) offers the most respected accredited certifications for strength and conditioning coaches and personal trainers. 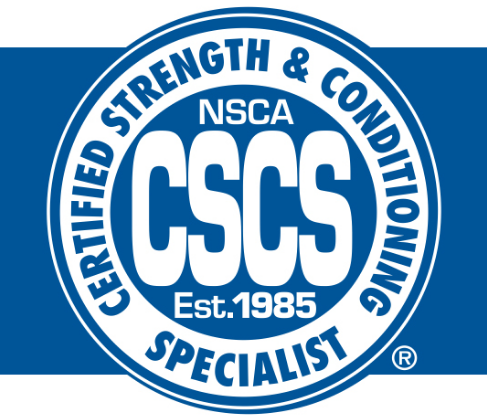 Certified Strength and Conditioning Specialists® (CSCS®) are professionals who apply scientific knowledge to train athletes for the primary goal of improving athletic performance. This sounded perfect to me. So I studied really hard and earned a NSCA (CSCS®) credential. When I first started the website, I didn't really know where it was going to lead me. I just knew what I had learned worked and I wanted to share it. I soon realized there are so many people out there that have the same problem I did. And what caught me off-guard was how helping people get what they want in life actually changed the quality of my own life. Creating this website, along with all the comments and questions I've received from my visitors has helped open new doors for me. And the REAL hidden benefit is the fulfillment I get when I see someone else change his or her life. That is what this website is about for me. I guess the next question is who are you? Maybe you're in the same place I was...or maybe you're a coach or parent looking for advice to help your kids improve at volleyball?